To develop, promote and deliver specialist and engaging environmental education programs for school students, tertiary students, teachers and community members. The cross-curricular programs will combine field experiences at Urrbrae Wetland with classroom based lessons to enhance learning experiences and allow the acquisition of a diverse range of viewpoints to help understand environmental issues. - To promote an awareness and understanding of wetlands in urban areas through hands on learning experiences, which encourage sustainable practices and values. - Offer programs across the curriculum that are authentic, practical and engage students in learning activities. - To equip visitors with the skills to take positive actions towards a sustainable future. 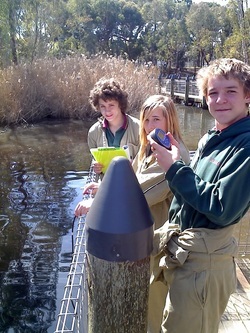 - To utilise information, communication technologies as an educational tool to connect Urrbrae Wetland with outside schools, universities and other organisations which encourages the sharing of information to achieve better sustainable and conservation outcomes for Urrbrae Wetland. - Promote a better understanding of the values, functions and benefits of wetlands in urban areas.